If you have never heard of blasphemy laws in Muslim countries, they are written to defend the Quran, Mohammed, and the basic beliefs of Islam. Should someone deface or destroy a Quran, that is blasphemy. To make jokes about the Prophet, or write something that traditional Muslims would not like, or to draw cartoons of the Prophet – all those are blasphemy. The blasphemy laws, however, only exist in Muslim countries which have non-Muslim populations. And so, they are invoked quickly and easily by Muslims who want a non-believer’s land, or water, or daughter, or job, or position. If an imam preaches that a Christian from a certain neighborhood blasphemed, then the mobs rise up and sweep down on the unarmed people. The mob sets houses and stores on fire, loots buildings, beats the men and rapes the women, and all this happens in our enlightened 21st century. And the police and soldiers usually stand by doing nothing. The most famous blasphemy case now is that of Asia Bibi, a Catholic Pakistani woman who was falsely accused and lives in isolation in a jail under constant threat of death. Now a Pakistani lawyer reports to Aid to the Church in Need that 95% of the blasphemy cases are false. Yet the laws remain on the books, and the provisions of the law are routinely ignored by the police and the courts. Oh, and the penalty if you say something derogatory about the Prophet? Death. What a great ally we have. PS Check out Saudi Arabia’s treatment of non-Muslims sometime, another great ally. And go here http://www.ucanews.com/2011/12/12/attacked-buildings-still-unfinished-say-christians/ to read about how the Pakistani government has failed to rebuild an entire town that was set on fire because of one such false charge. How these ordinary Christians get up in the morning and head out the door into such a hostile and uncaring society is beyond me – they must be fortified by the Holy Spirit! Consider supporting Aid to the Church in Need. Founded to support the German Catholics expelled out of Eastern Europe in 1945-1948, and then to support the Church in the newly communist states, today ACN works for the relief of persecuted Catholics or endangered Catholics anywhere in the world, and the reconstruction of church life in formerly communist states. And unfortunately, they have a lot of work to do. They do a super job of reporting! 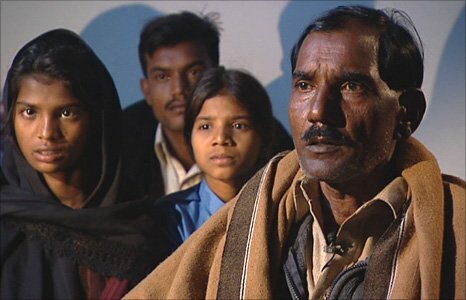 The family of Asia Bibi: Ashiq Masih, father, with their two daughters and a stepson. The woman police officer assigned to protect Asia in prison has instead been beating her, the family found out. The other officers assigned to protect her have done nothing.